What could be more relaxing than curling up to sleep in your very own bird’s nest bed! Conceived and created by O*GE CreativeGroup, the “Giant Birdsnest for Creating New Ideas” was developed as a fun space to encourage socializing and playtime. The bed combines a comfortable area for sleeping with a big area for kids to play, so when they’re tired from all the fun and games they can snuggle in and fly off into an inspiring dreamland. 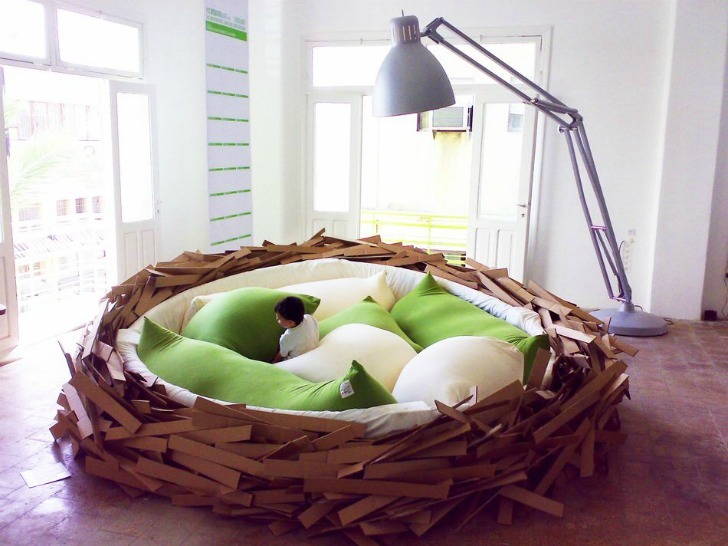 O*GE CreativeGroup‘s cozy retreat is surrounded by a “nest” of cardboard, and it comes in three different sizes – the largest one measures a massive 4.5 meters in diameter. O*GE claims the biggest nest could potentially hold up to 16 kids at one time, making it a brilliant place for a cozy storytime or a giant slumber party. 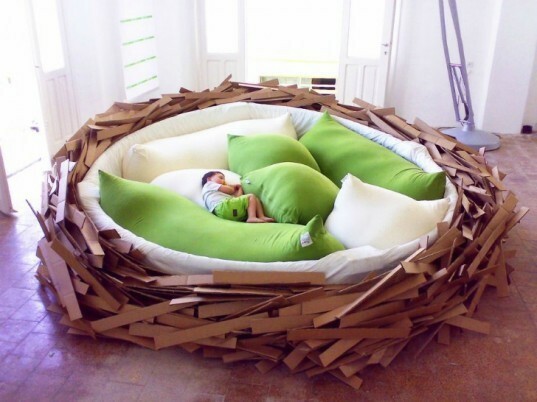 Whatever its use, we think this bird’s nest bed is a cool and fun idea and perfect for children and adults alike. I most defintely want (2) 0f these Beds. How much & where do I purchase them? What could be more inspiring and relaxing than curling up to sleep in your very own birds nest bed! Conceived and created by O*GE CreativeGroup, the full title of this awesome design is the “Giant Birdsnest for creating new ideas” and was developed as a new inspiring social space. The bed combines a comfortable area to sleep with a big space to play, so presumably when kids get too tired from playing around in their amazing birds nest, they snuggle down and head off into inspiring dreams.